Good news for those of you using Amazon Prime. 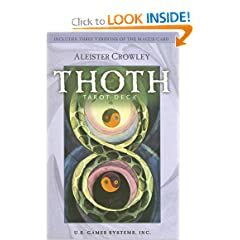 Amazon.com now has the small U.S. Games Thoth Tarot deck in stock and is selling them for a very good price. The magnificent Crowley Thoth Tarot Deck contains the kabbalistic and astrological attributions described in Aleister Crowley’s The Book Of Thoth. Small 80-card deck, including 3 versions of the Magus card, with instructions and bonus full-color spread sheet. U.S. Games has four different decks in stock, including the three U.S. Games editions (the large size deck shown at left) as well as the pocket-sized AGM printing. The magnificent Crowley Thoth Tarot Deck contains the kabbalistic and astrological attributions described in Aleister Crowley’s The Book Of Thoth. See also our previous post where the other AGM editions can be found at great prices. Thoth Tarot starts at $21.25! Available in three sizes, these are new, shrink-wrapped, English language decks from the Swiss printing. Looks like TaroBear’s Lair found a few boxes of these in the back room! They are priced for quick sale. Get them while you can. The Thoth Tarot was created by the famous Aleister Crowley (1875-1947). Lady Frieda Harris (1877-1962) painted the cards. Although Lady Harris knew little about Tarot and its symbolism, under the guidance of Crowley she transposed all subtleties of his ideas into her paintings. Many a card was painted several versions, until one of them was approved by Crowley. The Crowley Thoth Tarot took over five years to be completed. It was first published in 1969, after the death of both Crowley and Lady Harris. The present edition was produced by utilizing the most advanced techniques of color separation and printing, thus faithfully reproducing the stunning colors of the original paintings. The Swiss printing of Crowley’s Thoth deck includes 78 cards originally painted by Lady Frieda Harris, under the direction of Aleister Crowley. Important and advanced textbook covers much more than just the Tarot. Crowley’s personal description of the Thoth Tarot deck, or Tarot of the Egyptians. Includes his theory of tarot; description of the Atu, or Greater Arcana, and the Lesser Arcana; and numerous illustrations. $10.50 is a good price.